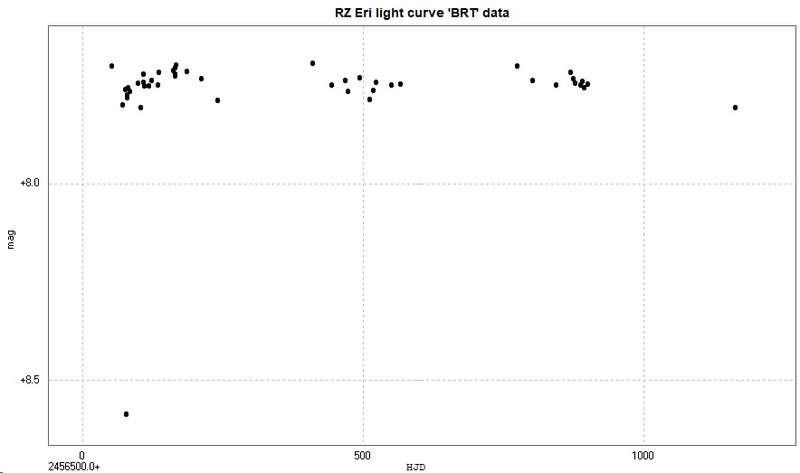 ​Light curves and phase diagrams of the EA type eclipsing binary RZ Eridani / RZ Eri. ​The first light curve and phase diagram were constructed from photometry of 46 images taken with the Bradford Robotic Telescope Cluster Camera (a 180mm fl telephoto lens, (BRT)) between 2013 September 15 and 2016 October 1, through a tri-colour green filter. ​The following light curve and phase diagram were constructed from photometry of 104 images taken with the Open University COAST telescope (a 14 inch SCT) between 2017 August 4 and 2018 March 10 through a V filter. ​Combining the above two sets of results generates the following light curve and phase diagram. The BRT data is in black and the COAST data is in red.